This spring Ucom comes up with the most awaited offer. 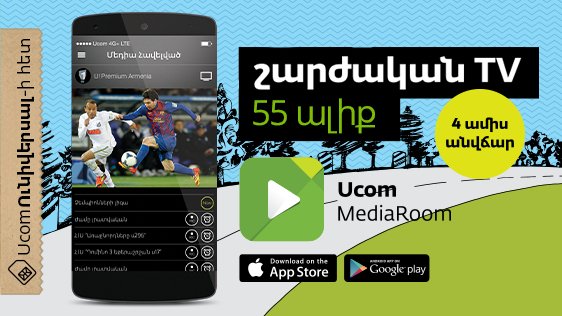 All those Ucom Universal tariff plan subscribers, who will activate MediaRoom application till June 30, have a possibility of watching the most anticipated football matches, TV-programs and series during consecutive 4 months absolutely for free, even while being away from home. And the most important thing is that when watching TV, the megabytes of internet inclusions won’t be consumed, and after consumption of inclusions, subscribers won’t be charged for used megabytes. The subscribers just need to download the application, text the word “TV” to 145 short number, get an activation code, enter it into the appropriate field of the app and that’s it. “Last year by launching the MediaRoom mobile TV application we acknowledged all the needs of our customers with dynamic lifestyle. And just a few months later we can confidently state, that the mobile television has never been this affordable and this accessible”, - said Hayk Yesayan, Director General at Ucom. Within the frames of the offer Universal tariff plan subscribers can watch 55 multi-genre TV-channels with 2-day Catch-Up possibility.